Microsoft Office 2013 allows you to add specific locations (such as local, network, or cloud) for storing your documents. The following instructions will allow you to configure Office 2013 to save your documents directly to your Lehigh OneDrive account. Open any Microsoft Office 2013 program directly on your computer. NOTE: If you do not yet have Office 2013 installed, you can do so by following the step-by-step instructions (COMING SOON). When the program opens, click Open Other Documents at the very bottom of the pane on the left of the screen. On the next screen that appears, select Add a Place. Look for the options displayed in the pane on the right. 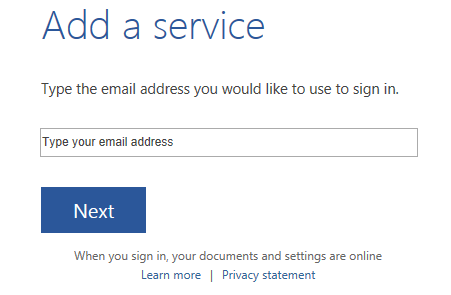 To connect to your OneDrive for Business account, select Office 365 SharePoint. NOTE: You will notice there is an option called OneDrive offered as well. This is Microsoft's consumer offering and not your Lehigh OneDrive account. Do NOT select the OneDrive option. A window will appear asking for your Lehigh email address. Enter your full email address and click Next. The next window will require you to enter your Office 365 password. Remember that here you are using the password you created for your Office 365 account only, NOT your regular Lehigh password. Click Sign In. You should now see OneDrive @ Lehigh University listed in the pane on the left. This will be the location you would save files to if you wish to be able to access them within your Office 365 account.